TGIF, Crafters! Valerie here today with this Christmas card featuring no-line coloring (and for me that's a first!)! 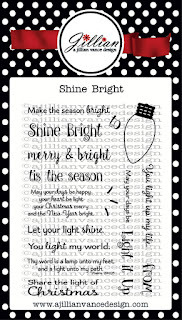 Those adorable light bulbs come from the AJVD Shine Bright stamp set. I stamped them with Antique Linen Distress Ink onto X-Press It Blending Card paper, then colored them with Copics. When I was done coloring the bulbs, I stamped the plug-in portion only of the same light bulb image with my Lawn Fawn Hippo ink, and then I painted the grey portion only with my Zig Wink of Stella Glitter Brush Marker. Then I glued AJVD Snowcap White sequins onto the light bulbs with my Tombow glue. For the sentiment, I stamped it with VersaFine Onyx Black ink onto vellum paper, and quickly poured clear embossing powder over it and heat embossed it. I then glued AJVD Scarlet and Kelly Green sequins onto the vellum. Now that I've overcome my fear of no-line coloring, maybe I'll try somemore detailed images! Thank you for stopping by today; have a wonderful day and a GREAT weekend! Wow! This card is just so bright and happy and your coloring is amazing! this is just soo cool!! Humility, honesty and diligence is the ferry life from shore to shore three pieces of magic weapon. Don't know how to tolerance will not get the respect of others, excessive indulgence will lose their self-esteem. Not to be beaten by others is the only way to know the truth is earlier than others. If life gives you a lemon, do not complain, should think, do need it is lemon juice.